ARTISANAT DES PRISONNIERS EN ANGLETERRE PENDANT LE 1er EMPIRE . . NAPOLEONIC PRISONERS OF WAR CRAFTS... One of the first recycling art. Artiste et origine exacte souvent inconnus.Artist name and exact origin often unknown. 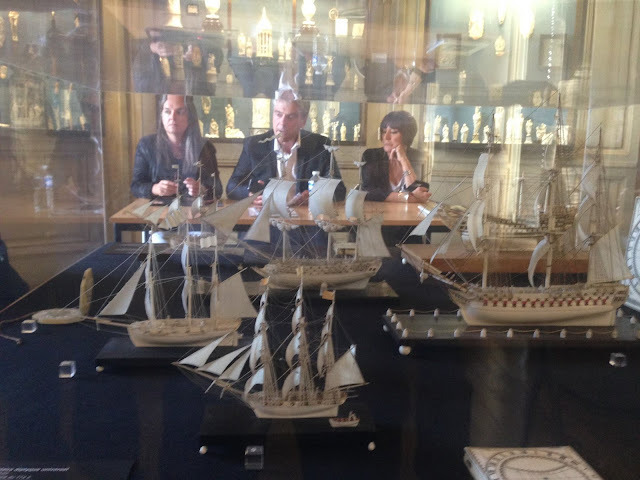 Vente Bonhams. 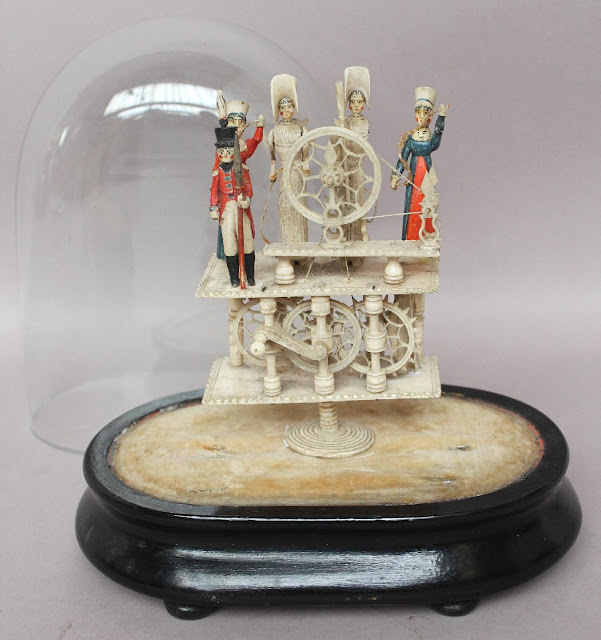 Lot d'objets peut-être fabriqués par des prisonniers des guerres napoleoniennes. Vente Bonhams. 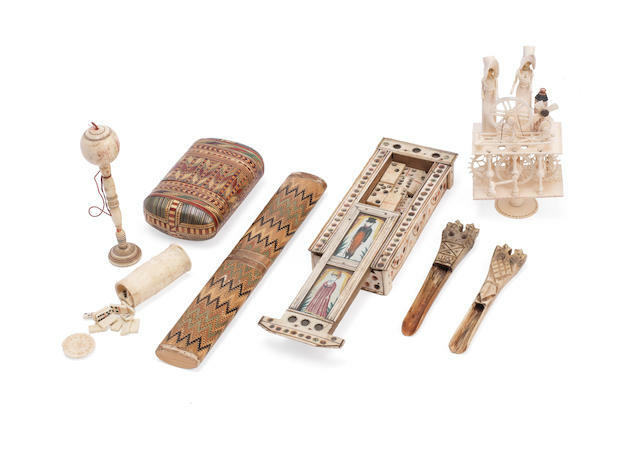 Lot d'objets peut-être fabriqués par des prisonniers des guerres napoléoniennes. 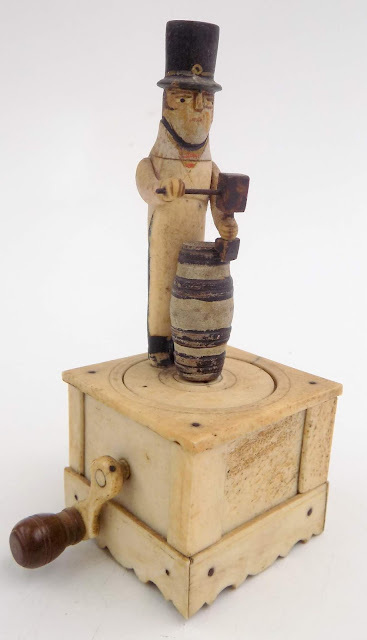 Lot d'objets peut-être fabriqués par des prisonniers des guerres napoléoniennes. 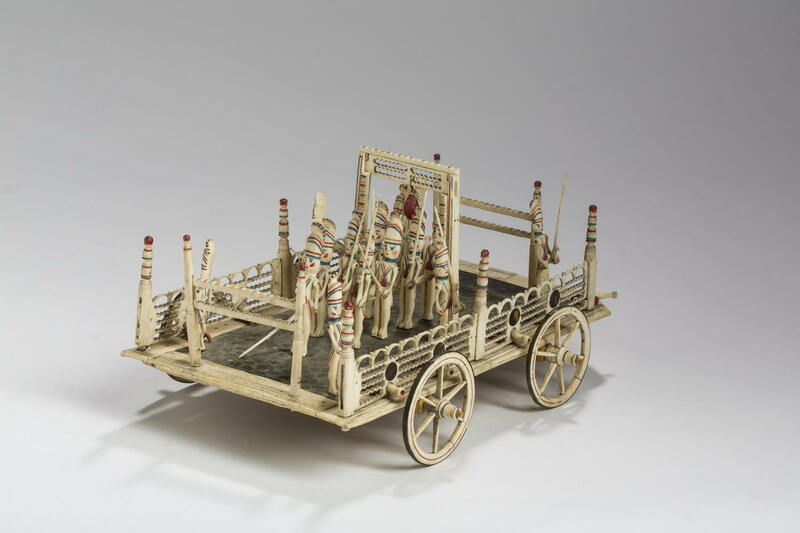 CARVED AND POLYCHROME-PAINTED BONE TROOP WAGON, EARLY NINETEENTH CENTURY. Heightened in red and blue, the wagon platform on four working spoke wheels, the delicate fretted sides applied with small tortoiseshell roundels and joined by turned columns, surrounded by six soldiers standing guard with moveable arms and carrying bayonettes, enclosing nine soldiers engaged in a drill, carrying bayonettes and standing underneath a gate with suspended target. Height 6 ⅛ inches, length 12 ¼ inches. Origine des plus belles fileuses en os animées "spinning jenny" ? 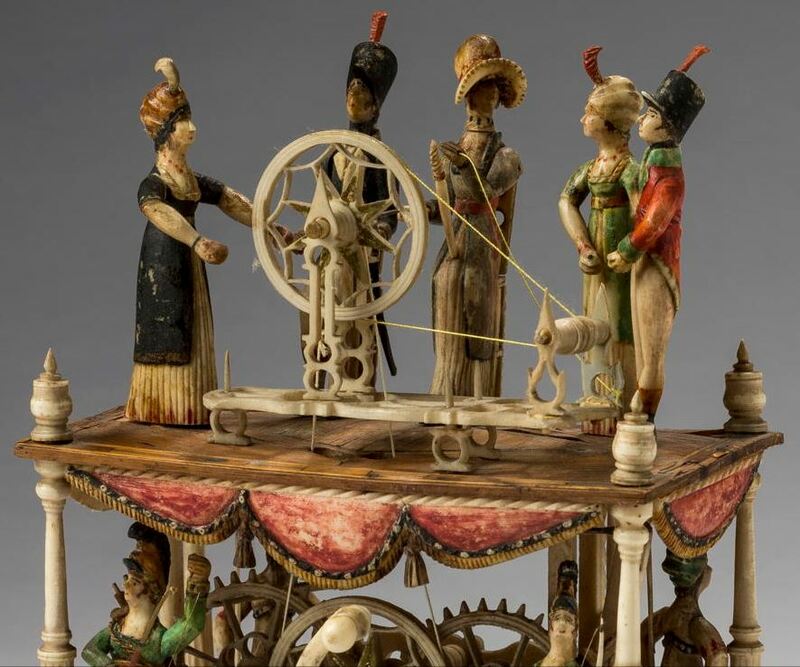 Origine des plus belles "spinning jennies" (automates), les prisonniers français en Angleterre , ou les artisans de Méru dans l'Oise avec les ivoiriers de Dieppe, avant , après 1815 ? 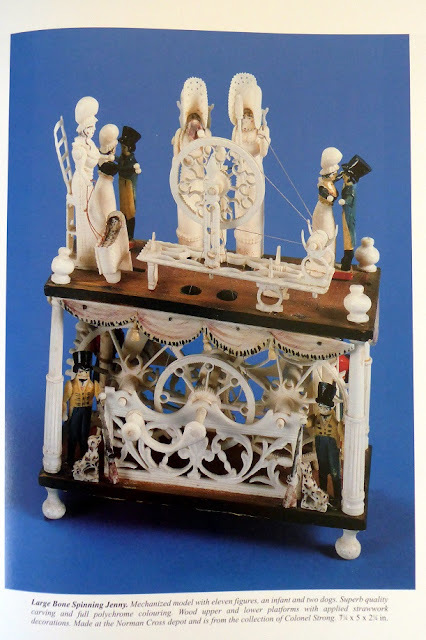 When, where and Who really made the most beautiful spinning jennies, bone crank automata, napoleonic PoW in England, or craftsmen of Méru , Oise France with other craftsmen of Dieppe, after or before 1815? les personnages en série, pour les placer isolément ou en scènes. 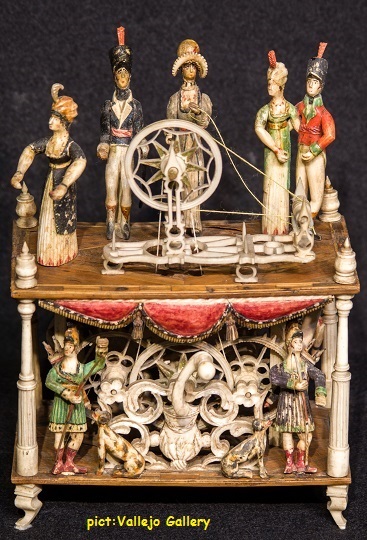 Spinning Jenny’s) or in sceneries. Spinning jenny achetée à Norman Cross par Mr. Wright at Norman Cross. avant 1815. "The group of figures on a platform (Plate XVI, Fig. 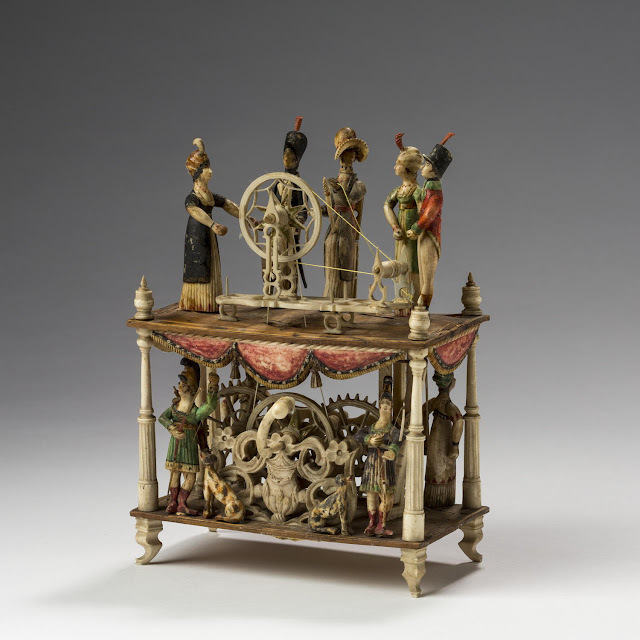 1), is one of many such mechanical toys or ornaments p. 131known to the author. This is beautifully preserved, having been kept in the box in which it was purchased for many years. 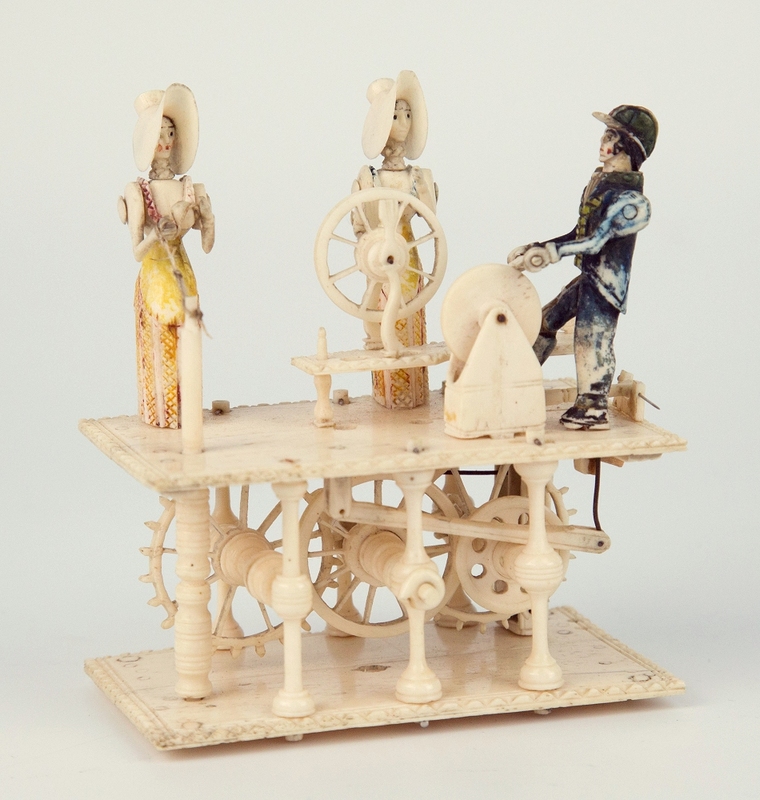 When the lower wheel below the platform is turned, by an arrangement of the threads passing over the wheels, the various figures move, the lady in the centre turns the winding-wheel, the child moves forward, the soldier and the lady waltz, the mother tosses her baby, turning her head to look at it, while the lady on the left prepares the tea. The owner of this ornament is the grandson of its purchaser." Thomas James Walker. From 1793 until 1814, over 200,000 French and French allies were held as PoWs, and whilst it's impossible to put a definite figure on it, several thousand of them would have been held in Wales. "L’ivoire est d’abord envoyé dans l’Oise, dans le canton de Méru, pour être débité, puis retourné à Dieppe pour y être sculpté, et enfin déposé à Paris..."
The Prison at Norman Cross, near Peterborough, was built to hold French and Dutch prisoners captured during the Napoleonic Wars between 1797 and 1815. 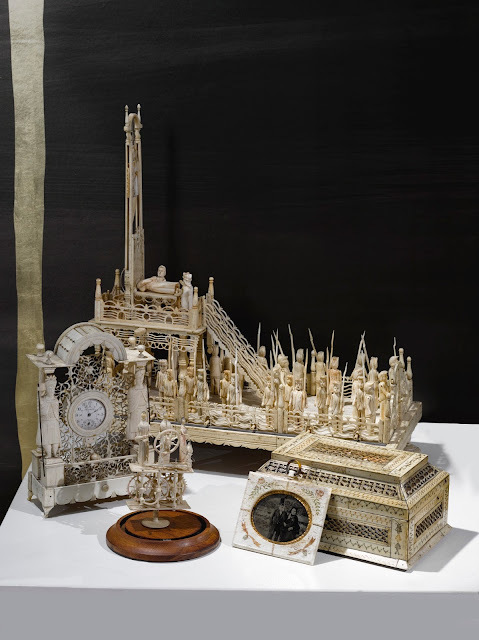 Considered both the largest and finest collection of such items in the world, the museum displays objects of carved bone and ivory, including model ships, guillotines, needlework boxes, playing cards and articles of straw marquetry. Turning the crank makes the barrel maker revolve around the barrel, with his hands moving up and down as if he is building it. Mechanism contained within the pedestal. 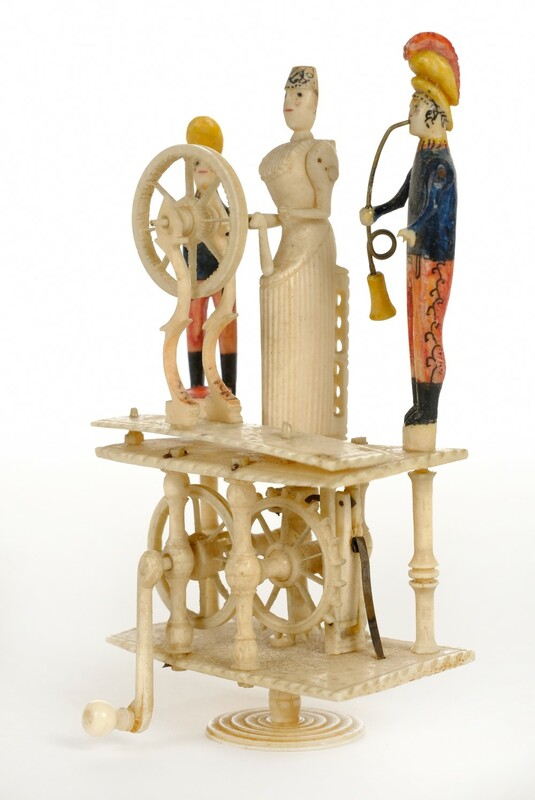 CARVED BONE MODEL OF A PERPETUAL MOTION ENGINE AND WHEEL. Mounted in a glass case with molded wooden base, the base affixed with a bone panel engraved “Perpetual Motion.” Height of case 8 ¼ inches, length 16 inches, width 9 inches. Provenance: Rafael Osana Auctions, Nantucket, Massachusetts. 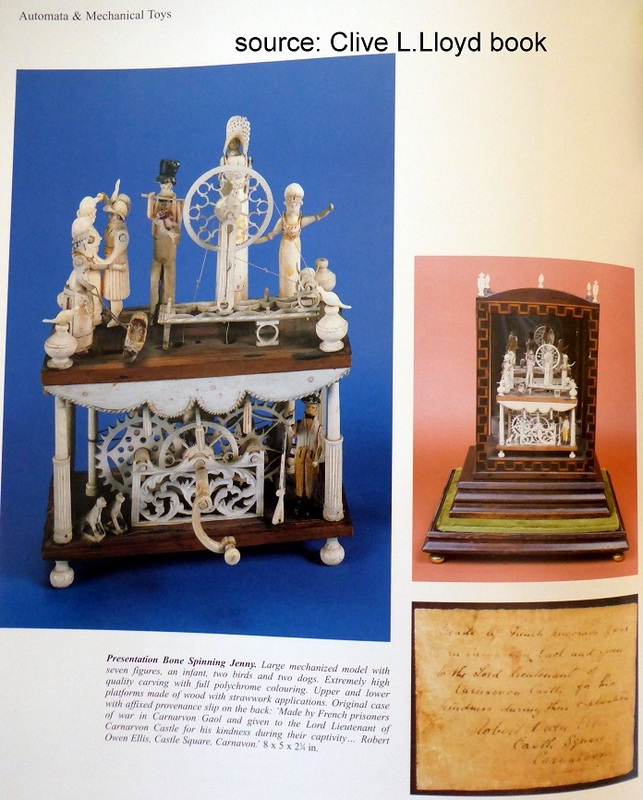 Domino game by Napoleonic POW ? Napoleonic Prisoner of War (?) 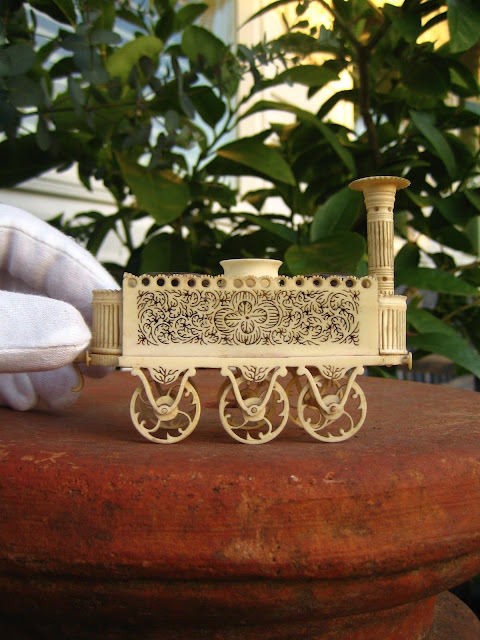 Folk Art Locomotive Mutton Bone Inkwell. Dimensions: Length 4 1/4 in, Width 1 1/2 in, Height 3 1/4 in. 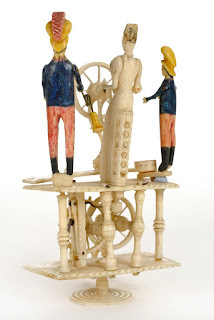 Automate en os à cinq personnages polychromes dit « Spinning Jenny ». 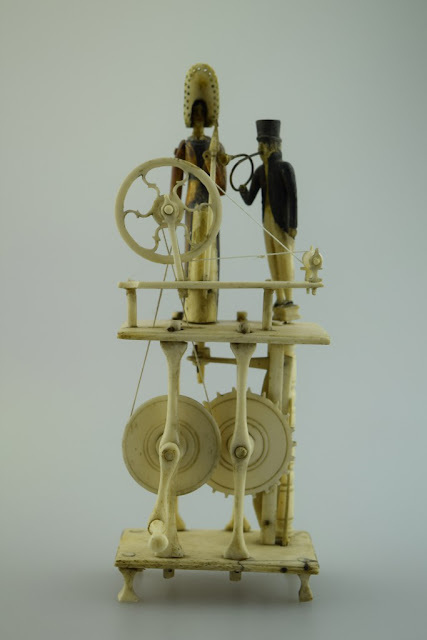 Mécanique à la base actionné par une manivelle. Travail de ponton. Angleterre Début XIX°. Haut 14,5cm. Height excluding glass dome 11 3/4 in. Mounted on a later ebonized base with glass dome, including a plaque inscribed H.M.S. 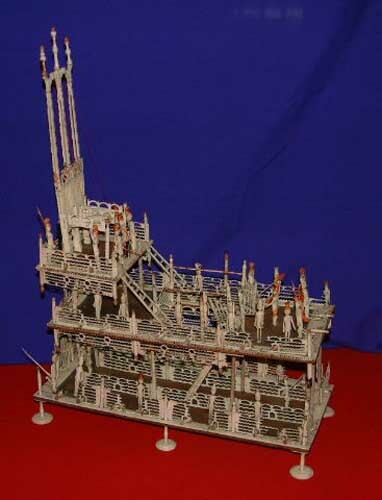 Glory - 98 Guns / 'The Glory' was launched at Plymouth in 1789. 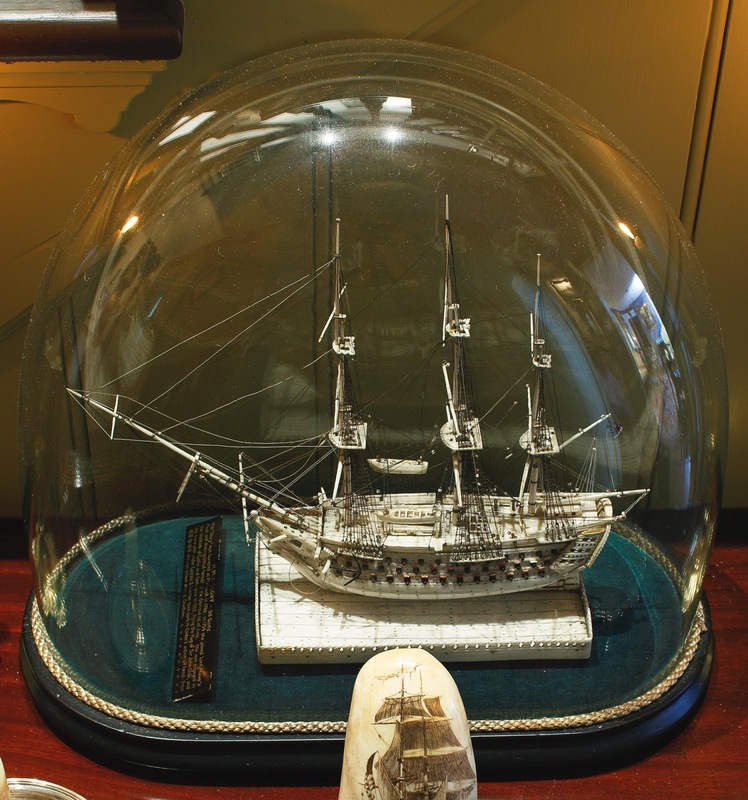 In 1794 she joined Lord Howe's fleet and distinguished herself at the Glorious 1st of June. 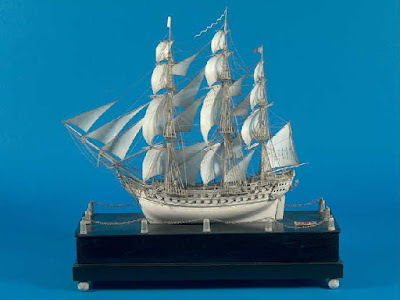 She was engaged in the blockade of Cadiz and Cartegena in 1805 flying the flag of Sir John Orde, and the same year under Captain S. Warren took part in Calder's action off Ferrol. Form 1809 to 1815 she was prison ship at Chatham. Artiste, date, et origine exacte souvent inconnus. Artist , date, and exact origin often unknown. 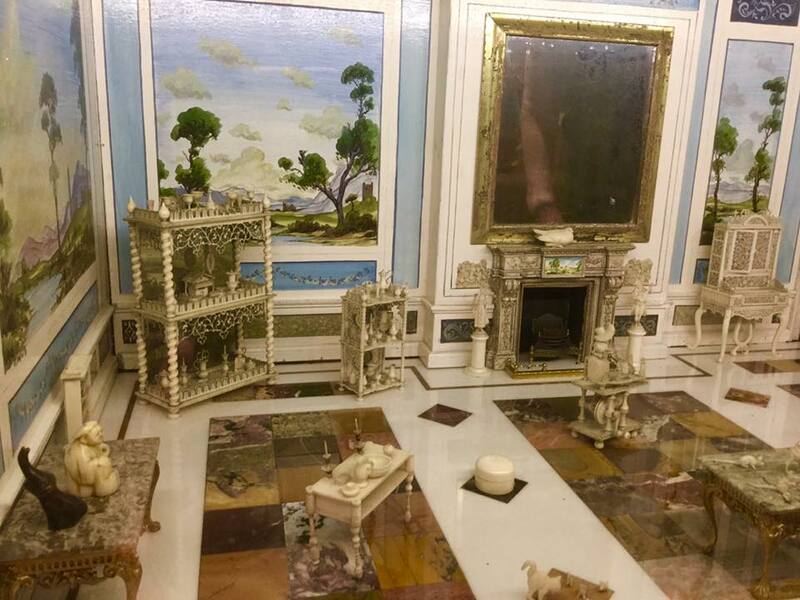 Artisanat dans les camps de prisonniers et pontons, en Angleterre, pendant les guerres napoléoniennes. 1793, 1815. 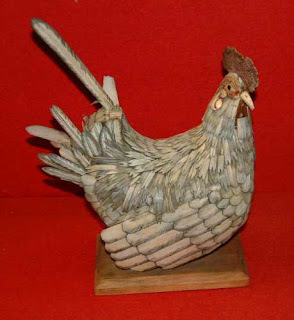 One of the first recycling art. Artiste, date, et origine exacte souvent inconnus. Artist , date, and exact origin often unknown.